It took us almost three years to have this done! After several futile attempts to have a tour/outing, finally, the long wait was over. Our destination is one of the best tourist spots in Quezon i.e. Padre Burgos. From a group comprised of 12 persons, only 8 decided to join the tour/travel. Thanks to Ara's boyfriend, we became 9. 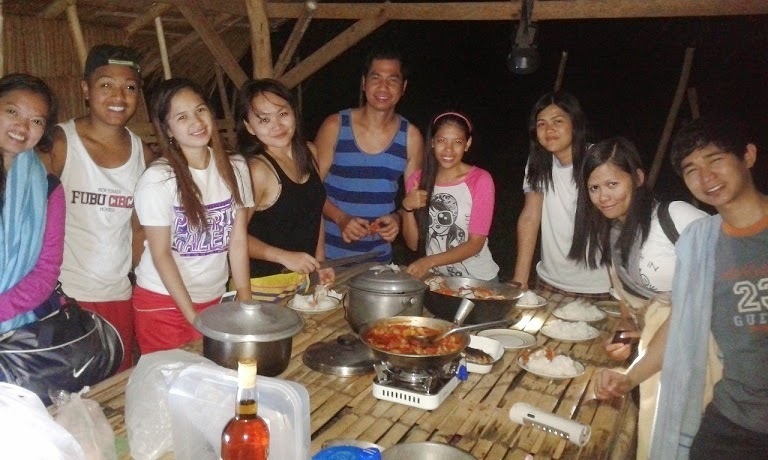 Only Ara, Jean, Kathy, Claire, Cyrene, Jaey, Aris, Anjella and I joined this event. Daisy, Doreen, Rizza and Joy were not able to join. Nonetheless, the fun and excitement were not diminished. Instead, we were overwhelmed by the fact that it was our first get together after several years of not seeing each other. It was my second time in Padre Burgos. My first adventure was May 2014. The call time was 5:30 am in Jollibee Sto. Tomas, Batangas. As usual, arrived ahead of time (5:15 am) but the rest arrived past 6:00 am. And Jean arrived 6:55 am. Thank you Jean. Board a bus going to Lucena. Fare from Buendia to Lucena Grand Central Terminal is P209.50 (127 kilometers). Travel time is 3-4 hours from Buendia. But I am from Tanauan City, and we boarded the bus in Sto. Tomas, Batangas and the fare was only P119.00 (72 ,kilometers). Arriving at the Lucena Grand Central Terminal, board a mini-bus to Padre Burgos. 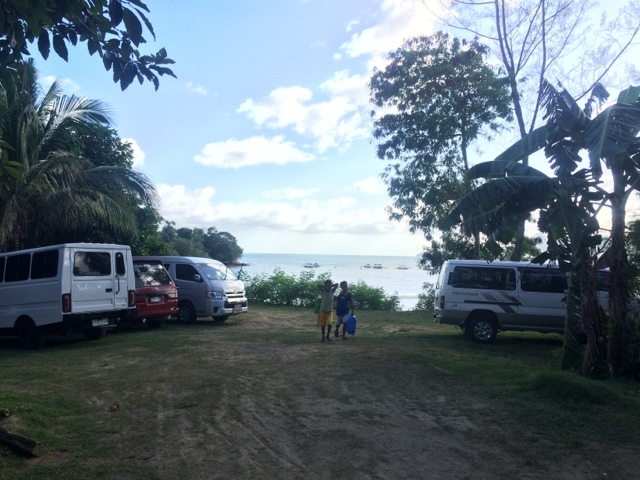 Jay-R is the only mini-bus servicing the route to Padre Burgos. The fare is only P35.00 and normally, travel time to the jump-off point is 1 hour and 20 minutes. The bus leaves after it has filled up majority of its seats (normally, 1 hour). Along the way, enjoy the scenery in Pagbilao, Quezon. The uphill twist and turns will surely keep you awake during the travel. Travel time depends on the traffic at the area. It is better to go early in the morning if you want to have an island hopping tour only. You can finish it in 3-4 hours, unless you want to take a swim. You will pass a big signage which says - Barangay Marao and on the left side is the Iglesia ni Kristo Church and you are a couple of minutes away. Then, alight at May Ann's Store at Barangay Marao and look for either Mang Rody or Aling Tess. Their house is less than 5 minutes away from the town of Padre Burgos. They are very cordial, accommodating and kind. In other words, you belong here. It is better to make a reservation prior to your tour/vacation. They have 6 boats. Their house is just along the highway. Do not bother to bring cooking utensils, plates and other kitchen materials. They will be lending it for FREE. You can even ask them in advance to reserve for you crabs, squids, fish or lobsters at an affordable price. Quezon offers the best and lowest price for sea foods. Mang Rudy and Aling Tess are simply the best! They have the biggest parking area. The Borawan tour includes hopping to Bagosina, Talabahan and the surrounding islands. It is a lot better to hire the boat for P1,800 and hop to ALL the islands. You can finish it in one day. Only Borawan island has a canteen. It is better if you already have your food supplies prior to going to the islands. 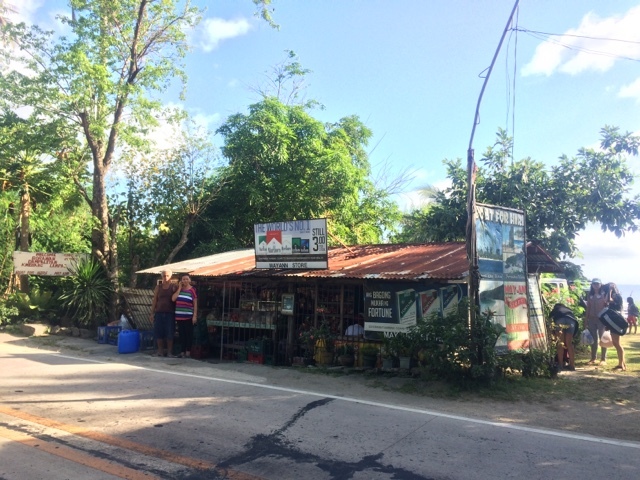 Aling Tess also has a store and you can buy your supplies at a very affordable price. There are several options for your food. Option 1 - Bring the raw food and cook it yourself in the island. Option 2 - Have the packaged food prepared already by Aling Tess. Option 3 - Buy the food from the market and hire the cook for only P350.00 for the entire day/overnight. Best time to go the islands is from March to June. Worst month is August when the waves are really strong! We took our early breakfast at Jollibee Sto. Tomas and boarded the DLTB bus in Sto. Tomas past 7 am. We reached Lucena Grand Central Terminal around 9:30 am and boarded the minibus to Padre Burgo and reached our destination 11:00 am. Due to lack of time, we took our lunch onboard the boat to save time and it was a great experience for ALL of us! Our first destination that day was - Puting Buhangin and Kuwebang Lampas in Pagbilao, Quezon. The boat ride to the island was good for 45 minutes. 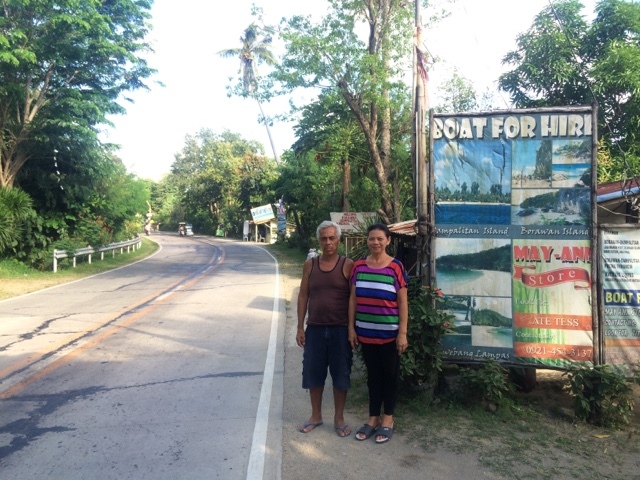 You can also reach this destination through Pagbilao but the boat rental is P2,500 and you have to walk for less than a kilometer in order to reach the spot. And in case you want to go to Borawan and Dampalitan, they will charge another fee (P1,000 - P2,000) for the boat ride. So it is a lot better to hire the boat in Padre Burgos for only P1,800. Everybody was enthusiastic when we reached the island. They were having second thoughts to swim because it was very hot that day and the waves are a bit strong (due to the LPA somewhere in in Northern Luzon). Entrance fee in the island is P80.00. It is the best spot to do snorkeling, swimming and diving. The water is clear and pristine compared to the other islands. What we did was to go and explore Kuwebang Lampas as our second adventure for the day. The boat ride going to Puting Buhangin was the first adventure! We had to wear our life-jackets since the waves are quite strong inside the cave. After the adventure, we decided to swim back to our boat (approximately 700-800 meters). But half-way through the swim, we decided to walk. We are definitely NOT swimmers! The tour will not be complete without a jump shot and why not have one! Contact persons in the island are Rolly Ferrer (0918-268-9402) and Gemma Raminto (0947-591-1630). Cottage rent is P250-P350. It is better to bring your own tent or rent the tent of Mang Rudy for only P300/tent. Second destination for the day was Dampalitan Beach. It took us 30 minutes to reach the spot and once there, the first thing that we did was to take our second lunch. We were exhausted and famished because of our wave adventure inside Kuwebang Lampas. Entrance fee is P80.00. It was low tide when we reached the island (around 2 pm). And we explored the island! We took a lot of souvenir pictures in the island and nobody bothered to swim. We even went to the other side of the island by foot. Dampalitan is a small island and you can trek it in less than an hour. Some of us enjoyed the hammock offered to tourists for free. Dampalitan is the only island which offers hammock for your respite. After an hour, we decided to go to our last destination for the day. I think the best/worst part of the island hopping tour was the ride from Dampalitan to Borawan. If you are a thrill seeker, you will definitely enjoy the ride! But if you are not used to have strong waves hitting you while onboard the board, you will surely ask for Divine Intervention. And after 20 minutes of boat ride, we reached the spot - Borawan Island. And after 45 minutes, we left the island. It was already 5:50 pm and we had to go back and pitch our tents and fix our dinner. In order to save time, we decided to divide the duties into 2 groups. The first group will be in charged of pitching the tents and the other group will be cooking our dinner. It was already dark when we were able to finish pitching the tents. Due to the LPA in Northern Luzon. there was no sunset that day. With the help of Mang Rudy's men, we were able to prepare a sumptuous dinnder composed of Pork Afritada (spaghetti sauce?? just kidding Ara! LOL), grilled fish, and steamed crabs! And dinner was served! After finishing our respective chores, we had a little bit of drinking spree and played several games. 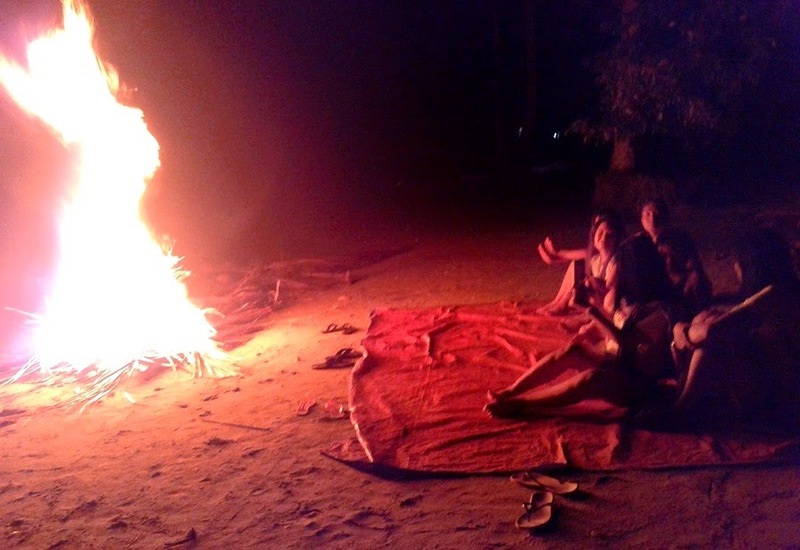 The best part of it was when we had our bonfire! I slept past 11 pm but some of us decided to sleep/rest in the beach. I woke up 3 am and they were still in the beach. They were enjoying the splendor of a full moon that night. Around 6 am, we decided to prepare our breakfast. We were able to take our breakfast around 7:30 am and broke our tent afterwards. We went back to Many Rudy's house along the road and fixed ourselves. We bought crabs and tikoy for our pasalubong and left Padre Burgos around 10 am. We definitely enjoyed this tour! Hi. pwede po ba kahit hindi na mag island hopping? magkano po magagastos papunta sa dampalit/borawan? Hi, okay lang po ba if mga 6am andun na kami? kase we are planning na umalis sa manila ng 12midnight pra nandun na kami ng around 6-7am..